Even though I have long followed the sport of track & field, I shake my head in disbelief when I look at the eight-foot ceiling in my house and try to visualize someone jumping over a bar that high. Yet, I know that the world record in the high jump is eight-feet, one-half inch, by Javier Sotomayor of Cuba, set on July 27, 1993. I didn’t see that world-record jump, but I can believe it, as I’ve seen other humans jump three or four inches under that height and I am familiar with the high standards of officiating in the sport. I don’t have to see it to believe it. However, I have encountered countless skeptics who refuse to believe in certain psychic phenomena because they can’t do it themselves, because they’ve never witnessed it, or because it defies the laws of materialistic science. They suffer from “Doubting Thomas Syndrome,” so-called because the apostle Thomas refused to believe in the resurrected Christ until he could touch his wounds. I’ll admit that many things in the psychic realm which I’ve read or heard about exceed my boggle threshold and so I am skeptical to some degree or another. But when I read the testimony of distinguished scientists and scholars who have witnessed it countless times under controlled conditions, my skepticism begins to erode toward belief. Then again, when I see illusionists pull off amazing tricks on television, such as on “The Carbonaro Effect,” I begin to wonder if somehow those researchers were victims of some very clever illusionists. 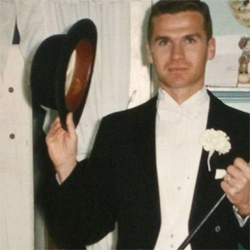 I’ll also admit to be being a pretend illusionist about 55 years ago (see photo). I’ll usually reason my way back to a high degree of belief in the phenomenon by concluding that there is manipulation of some kind going on with the photography that the home viewer can’t see, but I continue to wonder how the victims of the trick on television are so easily duped. While I can accept that even world-renowned scientists, such as Sir William Crookes, who claimed to have witnessed floating accordions, levitations, and other amazing phenomena with medium D. D. Home, could have been duped a time or two, I struggle to believe that he and so many intelligent men and women could have been fooled dozens, even hundreds of times. Professor Charles Richet, a Nobel Prize winner in medicine, claimed to have witnessed medium Eusapia Palladino more than 200 times. “Even if there were no other medium than Eusapia in the world, her manifestations would suffice to establish scientifically the reality of telekinesis and ectoplasmic forms,” said Richet, who also observed phenomena with many other mediums. “Yes, it is absurd; but no matter – it is true,” Richet asserted. It should be noted that even though Richet was certain no trickery was involved, he still refused to believe in spirits. He saw it as some kind of subconscious workings of the medium’s mind. My friend Doug is also a long-time follower of track & field and has even written books about “unbelievable” feats in the athletic arena. He has no difficulty in accepting an eight-foot high jump, but he refuses to believe that anybody can bend a spoon without applying physical force. He believes that all reports of such a phenomenon are just so much hooey. Doug is a big fan of James “The Amazing” Randi and recalls that Randi supposedly exposed British psychic Uri Geller’s sleight of hand in spoon-bending on television some years ago. As I recall, there is another side to that story, but I don’t remember exactly what it is and I am not interested enough to research it. About 15 years ago, I attended a conference in which a medium (I think it was Anne Gehman) gave a spoon-bending demonstration and then had forks and spoons distributed to all in the audience, around a hundred people. I don’t recall the ritual that the medium led us all through, but I believe it was something like closing our eyes and gently rubbing the neck of the spoon or fork between the thumb and the forefinger while visualizing it bending. However, I do recall that more than half the people in the audience, including my wife, Gina, had spoons and forks curl up on them without physical force being applied. Several people, including the woman sitting to my right, had the four prongs on the forks they were holding curl up into tight knots. I confess to being one of the failures that night. When I told Doug about what I had observed at that conference, he still refused to believe it possible. The closed eyes and the light finger rubbing suggested fraud to him. He asked that Gina demonstrate the next time we visit his neck of the woods. I told him that she really hasn’t tried to bend a spoon since then, but I’m pretty sure that if she were to try it again in front of him that she would fail. Doug saw my reply as an admission that we were somehow duped, even though we don’t know how we were duped. When I told him we still had the spoon (see photo), he suggested we have a metallurgical test done on it and we would discover that it was a special cheap metal that bent from the friction generated by the heat from the light rubbing. If you put “spoon-bending” into an Internet search, you’ll get the skeptic’s view on how it is done while also finding a few explanations suggesting real telekinetic or psychokinetic powers, or mind over matter. One such site states that you have to “be one with spoon” and feel the energy between your fingers. I don’t know how the spoons curl up, but I am more inclined to accept some mind-over-matter explanation, possibly greatly enhanced by the group energy, over cheap metal. The four prongs curling up on the fork held by the person sitting to my right is ten times more mind-boggling to me than the curling of the spoon, especially since the woman’s fingers were supposed to be rubbing the neck of the fork and not the prongs. The skeptic will likely conclude that the woman was a “plant” by the medium. If so, there were many such plants in the audience. •	How come Sotomayor never replicated that world-record jump? •	How come nobody has replicated it in more than a quarter century? •	How do we know the officials weren’t bribed by the Castro regime of Cuba? •	Did each of the officials have proper training in measuring techniques? Did at least one of them have a Ph.D. in mathematics? •	How do we know that the officials weren’t drugged and weren’t hallucinating? •	Could the officials have been hypnotized to think they were seeing 96.5 inches on the measuring device? •	How do we know that the measuring device wasn’t ‘doctored’ beforehand and off a few inches? •	Is the measuring device still available for calibration? If it is, how can we be sure it is the same one used 26 years ago? •	Was Sotomayor tested for performance-enhancing drugs? If so, could he have used one of those drugs that defies testing? •	Did anyone check Sotomayor’s shoes for hidden springs? •	Could an illusionist have been employed to make it appear that he cleared the bar when he actually went under it? Is there anything we can accept as absolute truth? Thanks for taking the time to quote Moses’controls. As I have stated, the objective seems to be to move from the blind faith of religions to conviction. Conviction is not absolute certainty, but it brings a peace of mind that far exceeds the blind faith of religion. Thanks also to all others who have commented here. Hello, Mike: Regarding your question “Is there anything we can accept as absolute truth?” the answer is “no” if we continue to search in the world of externals. If we do, in this world and the next, we will always end up with the list of doubts at the end of your article. “Beware of encouraging the promiscuous evolution of violent physical power [when you seek for a psychic-medium]. Such comes generally from the lower and more undeveloped; and its development is frequently attended by spirits for whose absence you should pray. In the encouragement, especially in newly-formed [psychic-medium] circles, of undue care for physical marvels is a great risk. “Such are necessary to the work, and we do not in any degree undervalue their importance to certain minds. We desire to bring home evidence to all; but we do not desire that any should rest in that material form of belief, in an external something which is of little service to any soul. We labour for something higher… Nor do we rest content even with showing man that beings external to himself can interfere in the order of his world. If that were all, he might be so much the worse for knowing it. My comment: These Guides are so adamant for us to experience the inner life, the true riches of the soul, that they fear we might be made “worse,” even by knowing of their existence; bedazzled and distracted by a messenger from heaven, diverting our attention from the real action within. My comment: Feel the flow of the Guides’ argument. They say they have one “aim.” It is to inform us that we are “immortal,” that is, made in the image of God. By what demonstration? “by virtue” of the fact that we possess a divine “soul,” which is like a “spark,” a particle of the divine essence, “struck off” from God. And how shall we assure ourselves of this divine possession? We will know that our essential life is divine and from God because it will reveal itself as a “life that leads to progress,” to a “future of development and growth.” In other words, we can know that we are immortal, fit to live with the gods, by our awesome potential to enlarge and by a commensurate innate desire to improve, to become, to achieve, to soar. Granted, the egoic “false self” has dampened this success-mindedness with its fear, guilt, despair, and anger – but these merely cloak and overlay and do not represent our natural state. We are to “go within” and discover who we really are, the “made in the image” heritage from which we derive. “If we use such [phenomenal] power at all it is because we find it necessary, not because we think it desirable, save always as a means to an end… Regard [the phenomenal] only as means of conviction, as so many proofs to your minds of actual intervention from the world of spirit with the world of matter. Look upon them as such only, and use them as the material foundation on which the spiritual temple may be built. Rest assured that they of themselves can teach you no more than that ... you must go on to further steps. “When you can reach out beyond the phenomenal to the actual investigation of Truth for its own sake—when, in short, you can believe our pretensions—then we can open out to you a realm of which you are yet ignorant, and which has been far more fully revealed to earnest seekers in other lands than yours. To few only in your land have higher revealings of spiritual truth been vouchsafed. Even this means of communing by writing, which seems to you such an advance on the clumsy rapping out messages and such material means of communication is as nothing compared with the inner communing of spirit with spirit without the intervention of material signs… [we] encourage you to rise above the material to the spiritual plane. Regard the “scientific evidence” only as means to initial conviction, and then move on to the primary substantive issues of the soul’s destiny and one’s life in God. The greatest truths are mystically rather than scientifically discerned. Most of these “Intimations of Immortality” aren’t on a grand enough scale to warrant publishing in a book, but for the individual who experiences them they may be highly significant and meaningful. Maybe they are just coincidences or maybe they are a version of synchronicity but whatever they are, they can be meaningful to the person who experiences them. In the retelling of these experiences often much is left out. In my case of the truck sign saying “It’s time to let me go”, I didn’t say that this occurred after 7 or more years taking care of my invalid mother and 7 months in a nursing home in which she continued to deteriorate. Emotionally everyone was worn out as was my mother. The truck sign was not little. It was full size on the side of a very large truck. The truck was positioned perpendicularly to my car so that I could not help but see it as we were both stopped at an intersection stop light. Nothing else was written on the truck side. It truly did seem like a message from my mother or someone else to me. The dog sign was overwhelming for me. On the 1 year anniversary of my dog’s death, I had looked all day and hoped to see another license plate with the word “Woody” on it—- Woody 4 to be exact as the license plate a year previously said “Woody 3”. The sign that I eventually did see at the end of the day , not a license plate, was like an overwhelming explosion of the words “Woody” and “Dog”; a large poster about 5 feet by 5 feet. It seemed unbelievably meaningful for me and only me. The poster did not remain on the wall and I have never seen it again after many years. These occurrences are very perplexing. What do we make of them? Are they just meaningless coincidences? Or, do they suggest communication from another reality? Or, do we just mentally produce them ourselves in response to our intense emotionality at the time? and by the time we got there, she had gone. Perhaps it is not ‘scientific’ but I will always treasure that moment as a message with her name on it. As Amos has pointed out, I do not really doubt that Sotomayor jumped 8 feet, 1/2 inch. I was simply trying to wear the hat of a Doubting Thomas and approach it as a typical debunker approaches psychic phenomena. There are so many examples of very qualified scientists having observed a particular phenomenon on numerous cases when those unable to accept it come up with ideas like the scientist must have had an affair with the teenage medium, or he had a real will to believe and was so easily duped, etc., etc. Someone like Charles Richet, a Nobel Prize winner, witnessed a particular phenomenon 200 or more times under strictly controlled conditions, and yet the non-believer would witness one time and see nothing because the medium was affected by his negativity and had a bad day. Materialist science was more likely to accept the debunker’s report rather than that of Richet. It is well reported in the history of psychical research that harmony is a big factor in the phenomena. That also goes for nearly all sports, as you know. Sir William Crookes observed D. D. Home on 29 occasions, but saw him levitated on only three of those occasions, apparently because the power wasn’t high enough on the other 26 occasions. The spirits couldn’t produce on demand. Sort of like a baseball player can’t hit a home run every time at bat. Three out of 29 at bats is actually pretty good for most players. See my blog post of December 30, 2013 about the role of harmony in mediumship in archives at left. Thanks also to Tricia, Amos, Dian, Rick, Yvonne, and Nate for adding to the discussion. I agree with their comments. It would be interesting to find out more about the spoon bending experiences of Dian and Tricia if they have time. Spoon-bending is one of those cases that fascinate me because I am sure it is real, but I also think it’s not just a skill that can be learned and performed at will. It seems like faith-healing: there seems to be some kind of energy required, that is only present on certain occasions. I wish we could study these energies a lot more. Got very frustrated with Pentecostal churches in the 1990s when I could see fascinating spiritual phenomena occurring all around me and yet apparently zero interest from the people in the pews as to *what* was happening and *how*. They just wanted to be in the moment, which is fine, but then the moment stops, and the questions come. Today I find the idea of ‘mediating entities’ explains quite a lot. Whether ‘angels’ or ‘saints’ or ‘discarnate humans’, I think there are… beings which help convey these effects and if they’re not there or tuned in or are just deciding not to provide that service the effect doesn’t happen. The 19th and 20th century spiritualistic literature seems to explain a lot of the mechanics f all this, and then I find that Kabbalah was a few more centuries further ahead still. But the general idea seems clear. It seems that there is a conversation that has been going on for at least the last 500 years, very slowly trying to convey the essence of the physics of the upper world to us, in whatever metaphors are available, using as much detail as we can understand. Mike, I only submit these comments as your friend. Please re-consider comparing Javier Sotomayor’s high jump WR. You ask how come he never replicated this height? Well at some point a man has to max out in career and this was if. This man has jumped 7’4 1/2 at least 35 times in competition. 7’6 1/2 at least 27 times in competition, 7’8 1/2 at least 14 times in competition, 7’10 1/2 at least 8 times in competition. He did these jumps in well over 20 countries in full view of 100s of 1000s of spectators and in front of at least 50-60 competitors and 50-60 judges with many video tapes. Do you really believe that all of these were faked? The judges were all paid off? 1000s of people were hypnotized? That unskilled officials would be allowed to measure the bar or that the measuring tapes were all crooked? You might say no that only the 8’0 1/2 is questioned by you. My sources for his 8’0 1/2 WR and other jumps above are: Wikipedia (which previously you told me you didn’t believe), Track & Field News , ATFS Athletics yearbooks, Sports Illustrated, 1000s of newspapers. Do you really think they are all duped? Are in some conspiracy? Or even so many could be fooled or that the Cubans could have bribed all those judges? That Javier may have had springs in his shoes and none of his competitors, the judges or spectators would have been aware of that? Springs in his shoes? C’mon. To me there’s a heck of a lot more evidence witnessed by literally millions than there is for some of the events you’re asking us to believe. Did he used drugs? Yes, but I think it was cocaine? So what? Others used drugs and couldn’t match him. Oh well. I know you probably don’t want to believe this. I still regard you as a friend and you are entitled to your opinions but I think you could select a better analogy perhaps. Cheers! One such site states that you have to “be one with spoon” and feel the energy between your fingers. That leaves me out. I haven’t even a passing desire to be one with a spoon. Mike, I absolutely loved your questions. It’s true. I’ve bent spoons in the past. I share your uncertainty about some psychic phenomena. The boggle threshold has been crossed for me in many of the more flamboyant people, D.D. Home and Alec Harris for examples. Sometimes I think that the more I know about paranormal reports the less I am inclined to believe much of it. I also like to believe that little or no phenomena have occurred in my life but surprising to me as I say this, I say this discounting several, actually many, border line things that have occurred in my life which as Wordsworth might say are “Intimations of Immortality” e.g., lights and television going on less than an hour after my grandfather’s death; my uneducated grandfather telling me about a NDE he experienced when he was the last person I would expect to talk about an NDE; hearing my deceased father’s voice the day before my mother died; seeing a truck sign saying “It’s time to let me go” on my way to visit my mother during her last days in a nursing home; experiencing a psychic telling my wife that “Pearl sends her regards” when my wife had no idea who “Pearl” [Curran] was but, of course, I did; and last but not least, a car license plate with my dog Woody’s name on it on my way home from the vets after he was euthanized and a year later seeing a large sign at a hardware store on the one-year anniversary of Woody’s death that had the name ‘Woody’ and ‘dog’ on it multiple times; all significant to me but to no one else. I think that on my darkest days, I take solace in the Patience Worth writings. Those writings provide hard evidence that anyone can consider that strongly suggests or intimates a source for the writing from someone, someplace, other than the conscious and/or subconscious mind of Pearl Curran, unless one thinks that Pearl Curran was the reincarnated consciousness of Patience Worth and others. I think that case is almost unassailable. I think it provides ‘clean’ evidence. Perhaps that is why it is seldom discussed in depth in the field of psychic phenomena. There is not a lot to argue about in that case but much to read. If you are a dope then so are many top notch scientists, many of whom actually tested Uri Geller under the most stringent protocols. I deal with this very point in my forthcoming book. I have no doubt that some claims will be fraudulent but the phenomenon does occur. The investigative journalist who more or less set out to debunk Uri had to change his mind in the face of evidence. 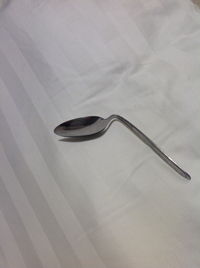 Incidentally, I have seen spoon-bending for myself.